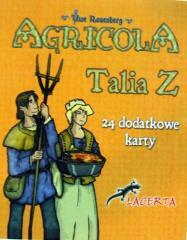 48 total cards to add to your Agricola game! The Z deck is the same deck that originally came in the 1st printing of the English game as a pre-order bonus. It adds 12 new occupation and 12 new minor improvement cards. The O deck is Austrian in theme (Österreich, hence the O) and it adds 12 new occupation and 12 new minor improvement cards. Originally available at the Gameplay Festival 2008 in Vienna, the cards were printed in German and only 3,000 were available. They have now been translated to English.